NEW! Now a participant in California's Mattress Stewardship Program. Mattresses from household sources are collected for recycling at no charge. 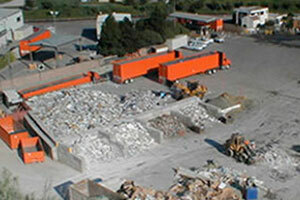 Accepts a variety of construction and demolition debris including scrap aluminum, appliances, asphalt, brass and bronze, brick, cast iron, concrete, copper, drywall, flooring, gravel, masonry, metals, pallets, sand, soil, steel, stone, tin, tires, and wood. Carpeting may be accepted depending on market conditions. Call ahead to confirm. Also accepts cardboard, glass containers, magazines and junk mail, mixed paper, newspapers, paperboard, and hard plastics nos. 1 through 7 for recycling. In addition, accepts a wide variety of electronic equipment such audio, visual, computer and office equipment, including desktop computers and peripherals, laptop computers, copiers, fax machines, scanners, printers, hair dryers, shavers, vacuums, microwave and toaster ovens, MP3 players, PDAs, VCRs, DVD players, televisions, computer monitors, cell phones, DVDs, CDs, and audio and video cassettes, video game systems, and holiday lights. Household and automotive batteries are also accepted for recycling. Will also accept agricultural waste and green waste, including Christmas trees for recycling. Open Monday through Friday from 7:00 a.m. to 5:00 p.m. and on Saturdays from 7:00 a.m. to 4:00 p.m.